We often fly Friday, Saturday and Sunday afternoons, weather permitting! Check the 'Where and When' page if you plan coming to join us for time and location as we don't have set times and places! 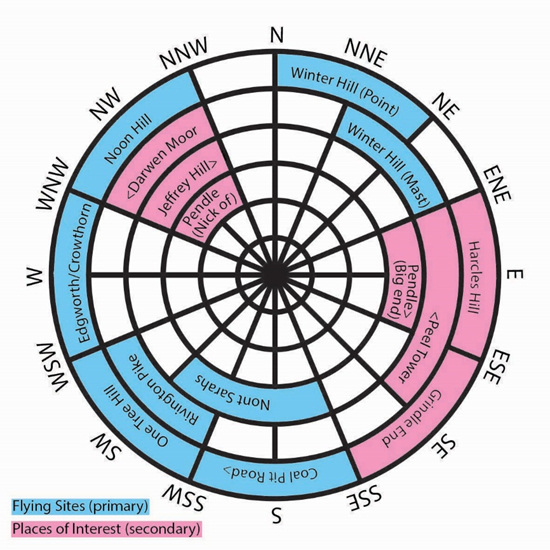 Use wind direction from weather forecast and the chart below to get an idea of where people are likely to be flying, e.g. wind from the West, likely to be Edgworth. The arrows (where shown) indicates direction bias towards where the hill is deemed to work better from. Enter your comment in the 'post a comment' box then from the drop down menu titled 'comment as' select 'Name/URL' and enter your display name, ignore the URL section (leave blank). Click 'continue' followed by 'publish' and you're done.